Submitted by witness on Wednesday, August 9, 2017. OBSERVED: Myself my dad and a few friends were on a big hike from Lion head up the wigwams and down to Kent lake then down Lion creek to the rock slides at Priest lake this was a two day hike. On the second day we were following Lion creek which is about 7 miles of just animal trails we had come across multiple spots where bear and elk had been sleeping and at one point we were about 10 min behind what we originally thought to be a bear, but once we reached its nesting spot we found huge prints that were about 16 inches long and about 7-9 inches wide, we were so close to what I can only describe now as a squatch that we could still smell it in the nest. We stayed there for about 10 min then continued to hike about 5 min later we started to hear tree knocks and such things. OTHER STORIES: Yes looking around this area growing up you hear many stories of sasquatch like rocks getting thrown at people etc. The witness and fellow hikers found a little cave. Then one-half mile ahead, they found a dead elk about two days old. One-quarter to one-half mile from the dead elk they found on mossy ground, sawgrass that appeared to be placed. It was eight feet wide, nine feet long and pressed down to three inches. They did not find any hair, but there was a musty smell like mold and urine. They found four to five tracks over six feet apart that started by the nest, then went onto a deer trail and then into the bushes. Four to five toes showed in these footprints. 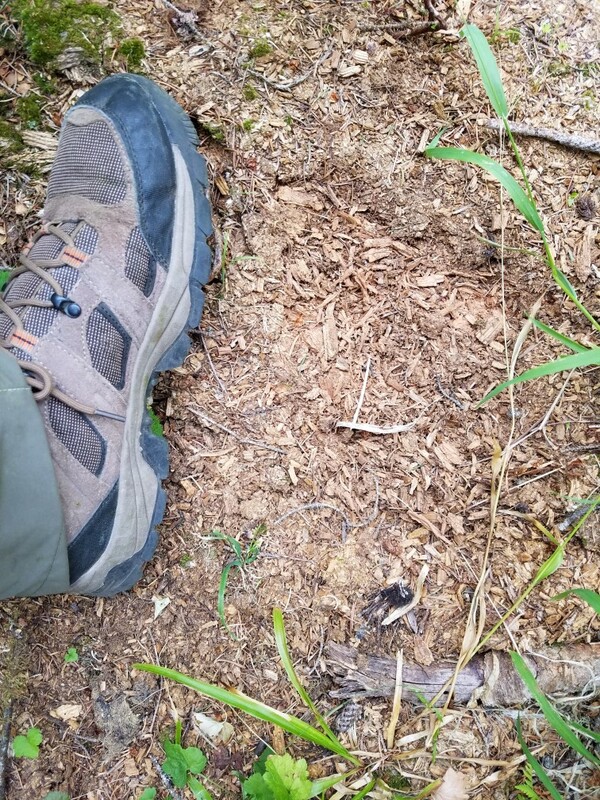 The tracks were in dry forest floor and one half inch in depth. The witness described the knocks simply as trees being hit. The hikers heard three knocks, one minute apart, each at a different location. The first was to the upper left and the other knocks moved in front of them. The hikers also heard some sticks breaking. The witness took these two photos. 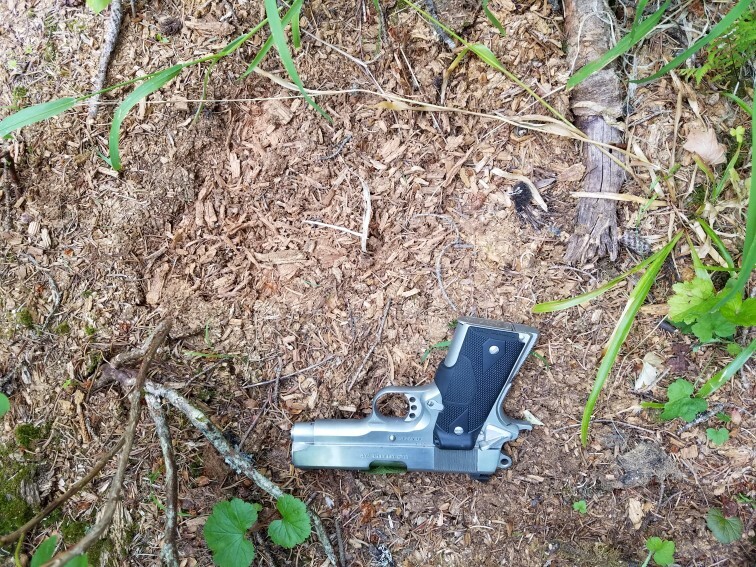 He placed his handgun next to one track. The barrel length is six inches. I found the witness to be very observant and credible. The location of this report is in the same general area as Report #42647.